When it comes to parties, it’s often a good idea to have bite-sized versions of everyone's favourite treats ready to go. This allows people to snack as they like and also try a range of different things that you have prepared. I like to have a big spread if I am having a lot of people over for an event. This makes it equally important to have a range of snacks but also to make sure there is something for everyone. Here are some great ideas for party food that won't steer you wrong. Nachos always seem to do really well at parties and by that, I mean they are usually always eaten. 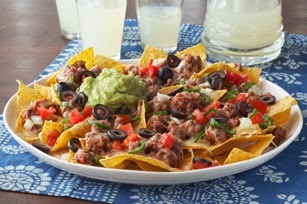 Kraft has a simple recipe for beef nachos. You can visit their website for more information about all of their different creative nacho ideas. It is always a good idea to add a healthier spin to nachos. If that is your goal, you might try using ground turkey instead of beef and using higher-quality foods instead of the cheaper off brand versions. Usually, organic versions have a lot to offer nutritionally speaking. Mini-quiches seem to be less frequent in the list of party snacks and are a great idea if you want to mix things up. Having the same tired party foods can sometimes be boring. So, take a break from your old favourites and try something new. Mini-quiches are very easy to make. To add a healthy spin to them, you can use almond flour for the crust, to avoid those blood sugar spikes. You can also opt to use organic, free-range eggs for your quiche. Free-range eggs have a higher amount of omega 3 which is an essential nutrient that we are not getting enough of these days. Add whatever ingredients you like to your mini-quiches such as onion, back, chicken, mushroom or tomato. First add cheese to the miniature crusts. Then just remember to include cream in the scrambled eggs before you divide it up among the other pies. Bake for 5-7 minutes or until golden brown. This is quickly becoming a party favourite in my house. Cake balls are very easy to make and allow you to mix and match cake flavourings with different types of icing and sprinkles. To get round balls, you are going to need a special pan but it should be easy to find. Just look for a pan that has indentations for half spheres. You will 'glue' the cake halves together with icing after they cool. Get creative with cake balls by adding wooden sticks to make them look like suckers or add a range of coloured toppings, like sprinkles. You might even want to add some food colouring to your vanilla frosting for extra wow factor! Why not get the kids involved and add a touch of personality to your spread. If you want to add a healthy spin to cake balls, try using almond flour and a homemade coconut oil icing. For a sweetener, you can use xylitol or stevia. Get crazy! With this range of offerings, no one should go hungry at your party. Remember to stock up on drinks and have plates and napkins ready to go. I love the nachos! And if you're serving them to someone who can't/doesn't eat the corn chips, you can serve the same nacho ingredients over fried potatoes or crispy french fries. It's a little odd but makes for a great tasting twist.